The KidKraft Espresso Toy Laundry Play Set turns you into a domestic goddess or god! This brightly colored toy washing machine and dryer can hold up to an infinite load of pretend play clothes and bedding and anything else that needs cleaning. Make that next game of house all the more realistic with this pretend play set. 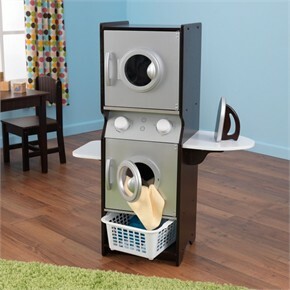 As a bonus, parents, this toy laundry set may get the kids excited to do chores! Ages 3+. Availability: The Espresso KidKraft Laundry Play Set ships in approximately 3-5 business days.